In a perfectly free-market environment, trade between countries occurs when private actors in those countries find it mutually advantageous to trade. Governments are involved only in that they create the market conditions that minimize transactions costs, thus maximizing the opportunities for mutually advantageous gain. In the real world, of course, governments do engage in all sorts of actions with the intent to protect local industries or jobs or culture or national security. Such actions reduce the possibilities for mutually advantageous gain. Of all the issues about which economists might agree or disagree, it is probably safe to say that there is no greater consensus among economists than that these actions, by and large, reduce social wellbeing in the long run, whatever their political appeal. Throughout much of the twentieth century, the world was divided into two economic camps: socialist and capitalist. The capitalist economies undertook in the second half of the century a steady movement toward a free-market trading environment. As a result, there was a substantial surge in trade throughout this period. Trade in the socialist word, on the other hand, was not based on market realities but, rather, on political and ideological considerations. One of these ideological considerations was that there should be as little trade as possible, that is, that they should strive to be self-sufficient. The bulk of the socialist world disappeared in Central Europe in 1989 and with the collapse of the Soviet Union in 1991. Transition to capitalism has advanced so far in Central Europe that many of the former Soviet Bloc countries and the Baltic republics of the Soviet Union entered the European Union in May 2004. Meanwhile, the People’s Republic of China has been undertaking a transition from the planned socialist system to a market system since 1978. Only Cuba and North Korea remain solidly in the socialist world. Our focus in this paper is Cuba. Cuba’s trade in the 1980s was almost exclusively with the Soviet Union and the other countries of the Council for Mutual Economic Assistance (CMEA), the Soviet-dominated trading arrangement of most the socialist countries of Europe plus Cuba. Under this arrangement, Cuba traded its sugar for Soviet oil at a preferential rate that amounted to (along with other economic and military aid) a subsidy of some four to six billion dollars per year, according to the CIA Factbook. With this Soviet subsidy, Cuba was able to deliver rather handsomely on the state’s social compact with the people to provide free, high quality health care, public health, and education; to end rural poverty; to maintain full employment; to provide blacks and mulattos with equal access to all forms of employment and government leadership opportunities; to provide food and housing at highly subsidized prices; and to provide early retirement with a livable pension (Gonzalez and McCarthy, 2004). This comfortable trading relationship began to unravel in 1989 and, by 1991 with the collapse of the Soviet Union, it was no longer. Cuba’s economy went into freefall; between 1989 and 1993, its economy contracted by about a third. Cuba was forced to develop new export products, including international tourism, as well as to find new trading partners for its traditional exports, especially sugar. Although it did stop the freefall, Cuba’s recovery has been sluggish and per capita GDP is unlikely to regain its 1989 level until 2009 at the earliest (Gonzalez and McCarthy, 2004). In 2000, Cuba exported about 1.8 billion dollars and imported about 3.4 billion dollars.1 Its main export partners were Russia (16.9%), Canada (15.3%), Spain (7.3%), China (4.5%), France (3.0%), Germany (2.6%), Belarus (2.3%), Netherlands (2.2%), Japan (2.1%), and Kazakhstan (1.8%). Its main import partners were Spain (17.9%), Italy (7.8%), France (7.6%), China (7.2%), Canada (7.0%), Brazil (3.0%), Russia (2.5%), Germany (1.9%), Netherlands (1.8%), and Argentina (1.6%). These trading partners accounted for over half of Cuba’s trade flows (58.6% imports and 57.9% exports). What is the extent of these non-market trade distortions? Would Cuba trade more if trade were based primarily on economic fundamentals? Would there be losers in the sense that Cuba would trade less with certain countries? 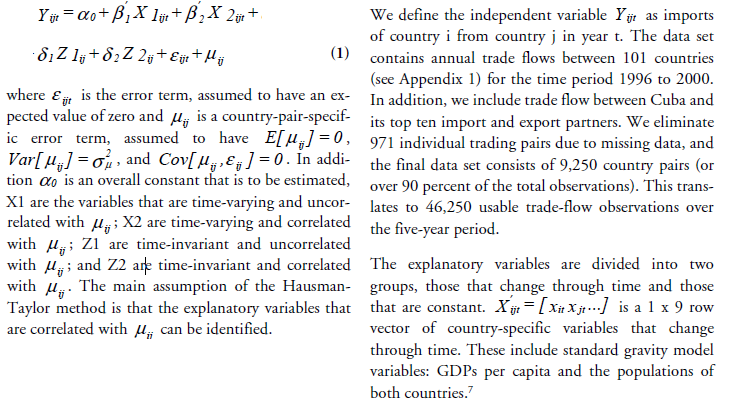 To answer these questions we use the gravity model of trade, which has been used to estimate trade flows since the early 1960s (Tinbergen, 1962; Poyhonen, 1963). It is based on the assumption that trade can be explained by size (GDP or GDP per capita) and distance (physical distance or various measures of economic distance such as a common border, common language, etc.). 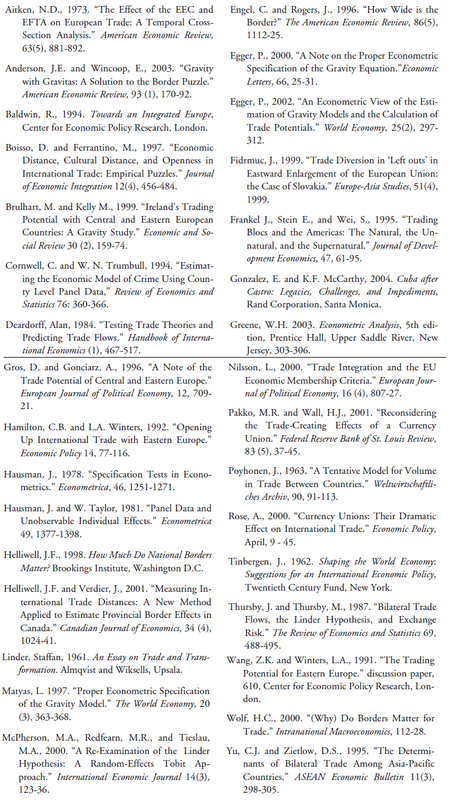 In various forms, it has been applied in studies analyzing the border effect on trade (e.g., Helliwell, 1998; Helliwell and Verdier, 2001; Wolf, 2000; Anderson and Wincoop, 2003), the impact of currency unions (Rose, 2000; Pakko and Wall, 2001), preferential trading agreements (Wang and Winters, 1991), free trade agreements, and removing trade barriers (Pakko and Wall, 2001). In predicting trade potential, the gravity model has been used in two different ways. In the out-of-sample approach, the gravity model of trade is estimated excluding the trade flows of interest. The model’s parameters are then used to project natural trade relations between countries outside the sample. The outof- sample trade prediction approach has been used in Wang and Winters (1991), Hamilton and Winters (1992), and Brulhart and Kelley (1999). The other strategy, and the one employed here, is based on in-sample predictions (Baldwin, 1994; Nilsson, 2000). In this method, a country pair under examination is included in the sample. The residual is then interpreted as the difference between potential and actual bilateral trade relations. Recent research has highlighted the importance of white-noise residuals when using this method.4 We utilize the gravity trade model and use the in-sample approach to estimate the trade distortion between Cuba and its top 10 trading partners (both imports and exports). Panel data, that is, periodic observations of the same cross-sectional units of observations, opens up a variety of empirical modeling possibilities. The fixed-effects model relegates all time-invariant (that is, fixed) effects into a constant term that is composed of one part that is common to all cross-sectional units and one part that is specific to each. With the fixed-effects model, it is possible to overcome the heterogeneity problem that often affects ordinary cross-sectional analysis in which unobserved fixed effects bias the estimates of explanatory variables with which the unobserved variables are correlated. The effects of heterogeneity bias can sometimes be quite severe. Cornwell and Trumbull (1994), for instance, were the first to apply the fixed-effects method to the economic model of crime. They showed that accounting for unobserved heterogeneity bias resulted in dramatically lower estimates of the deterrent effects of criminal justice variables, such as the probability of arrest. An alternative to either the fixed-effects or the (ordinary) random-effects models was proposed some time ago by Hausman and Taylor (1981).6 This method is a random-effects, instrumental-variable technique that uses only information contained in the model to eliminate the correlation between the error term and the included variables (the cause of the rejection of the random-effects model). As a result, estimation of time-invariant variables is possible without compromising the estimates for time-varying variables. Thus, the most appealing characteristics of the fixed-effects technique (consistent estimates of time-varying variables) and the random effects model (the inclusion of time-invariant variables) are combined. Because of these beneficial characteristics, we use the Hausman-Taylor estimation technique in our analysis of Cuba’s politically based trade distortions. To recap, we are asking whether the peculiarities of socialist management of the Cuban economy affect trade. If Cuba had conducted trade as trade is normally conducted within a capitalist country, would the total volume of trade have been different and would trade with Cuba’s current top trading partners be different than it is now? A question that we are not asking is whether Cuba’s trade is affected by the U.S. embargo. Not wanting to confound the two questions, therefore, we assume no trade between the U.S. and Cuba. Again, we only want to know the impact of socialist management of the Cuban economy, holding all else the same. The remainder of the paper is organized as follows. The first section contains a detailed description of the methodology used and a description of the data set. In the second section we summarize results. The third section concludes and offers ideas for future research. We also include a variable to capture a Linder effect: the absolute value of the difference in the partners’ per capita GDPs. This variable measures the economic distance between trading partners. One hypothesis of trade, the Linder (1961) hypothesis, postulates that countries export products that are similar to those which they consume at home. In this way, the country is able to minimize the risk associated with the production of new products. The net result is that firms will produce products for export which will also appeal to the home market. Therefore, trade is higher among countries that have similar tastes and incomes.8 This is in contrast to other models of trade. These argue that differences in factor endowments, and not income, are determinates of trade. Since a small difference in per capita GDP (in absolute value) indicates a country pair with similar income, we expect this variable to be negative. The closer the countries are in their economic development and income (all else equal) the more they will trade. Findings by Baldwin (1994), Boisso and Gerrantino (1997), and Hamilton and Winters (1992), among many others, support an expectation of a negative coefficient for this variable. In addition, we include the absolute value of the difference of the two trading partners’ freedom index as a natural extension of the implications of the Linder (1961) hypothesis: the closer two countries are in terms of their freedom level, the more likely they are to trade. Thus, we expect a negative coefficient. Lastly, we include a variable to indicate both countries’ membership in a preferential trading agreement. This variable is based on World Trade Organization (WTO) records. It includes properly registered and recognized customs unions, free trade agreements, and service agreements.10 In addition to the multilateral preferential trade agreements, individual trading agreements are included as reported by the WTO. Member countries enjoy the benefits of reduced transaction costs (such as tariffs), which would presumably lead to higher levels of trade.11 However, Ceglowski (2000) and others find evidence suggesting that free trade agreements have no effect on trade. 1. We transform X1 and X2 into deviations from their mean values over time for each country pair (i.e., the group mean deviations). These group mean deviations can be used as instrumental variables. This is based on the same logic as the fixed-effects estimator. The transformation to deviations from the group means removes the part of the disturbance term that is correlated with X2. 2. By definition, Z1 is uncorrelated with the error term and can therefore be included in the set of instrumental variables. 3. The final set of instrumental variables is the group means of X1 (as opposed to deviations from the group mean used in step 1 above). Since X1 is by definition uncorrelated with the error term, the group means of X1 are, as well. The model is identified as long as the number of variables in X1 is greater than the number of variables in Z2. The selection of the variables that should be included in X2 and Z2 is not obvious. Hausman and Taylor (1981) suggest using economic intuition. For X2, we select the absolute value of the difference in the level of economic freedom for both countries. 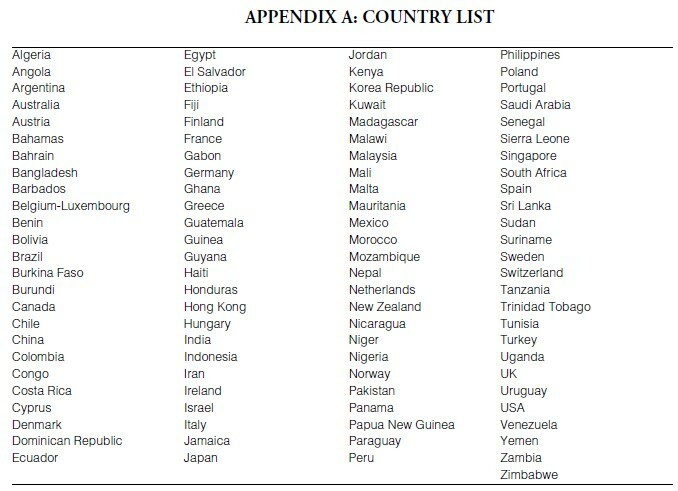 μij is the portion of the error term that contains all country pair specific elements not included in the model, and could easily be correlated with the relative levels of economic freedom. For example, the absolute difference in the levels of freedom could be correlated with other governmental or institutional characteristics that either promote or reduce trade, such as a highly stable (or unstable) political system or a tendency to autarky. In addition, such factors as the availability of trade credit could substantially affect trade between nations and be correlated with the closeness in two countries levels of freedom. The Linder variable (the absolute value of the difference in GDP per capita) is also included in X2. This variable captures the differences in the wealth of the countries. This variable could be correlated with μij because, for example, countries with similar wealth levels could have similar demographic, geographical, or cultural aspects which are included in μij, and not explicitly included in the model. Further, this variable could be correlated with the level of development of infrastructure, consumer preferences, and the ability to obtain hard currency. These are all factors which could determine trade flows, but are not explicitly modeled and are therefore included in the error term. Therefore, it can be argued that these two variables are the cause of the rejection of the random effects model; each of these variables has the potential to be correlated with other political, social, or economic aspects not included in the model and captured by μij. The test to detect this correlation is the Hausman- Taylor test. As we will see in the next section, the Hausman-Taylor method eliminates this problematic correlation through the use of instruments already included in the model. An F-statistic14 (to test for individual and time effects) indicates individual effects are present and OLS is not an appropriate estimation technique. Next, we test to determine if there is correlation between included variables in the random-effects model and the error terms. If correlation is detected, the random-effects estimator can be eliminated as a possible estimation technique. First we perform a Hausman (1978) test comparing the fixed and random-effects estimators.15 We conclude that there is correlation between the included variables and the error terms, and therefore fixed-effects is a better choice than random-effects. We then conduct an additional Hausman (1978) test using the fixed-effects and the Hausman-Taylor method to determine if the instrumental variable technique has reduced the correlation that plagued the random-effects estimator.16 We are unable to reject the use of the Hausman-Taylor method and conclude that, of the two alternatives considered here, the Hausman-Taylor estimator is the better choice. That is, the problematic correlation between variables included in the model (X2 and Z2) and the individual component of the error term that introduced bias into the random-effects estimator has been greatly reduced through the use of instrumental variables. Table 1 contains the parameter estimates from equation (1), the Hausman-Taylor method. All the significant parameter estimates are of the expected sign. Using these results, we then apply the in-sample technique to estimate trade flow potentials for Cuba and its top trading partners. Table 2 contains the average residuals for each trade flow of interest over the 5 year period. The results are presented such that positive (negative) values indicate unutilized (overutilized) trade potential. The information in Table 2 (panel A) suggests that Cuba has unrealized export trade potential with Canada, France, Germany, Netherlands, Spain, and Japan. All these countries are developed economies with long histories as capitalist economies. In contrast, Cuba has excess trade with Russia, Kazakhstan, China, and Belarus. All of the countries which display over-utilized trade potential have a common socialist past. In the case of exports, it is quite clear that the driving force behind Cuba’s trading patterns is political and not economic. Developed countries with capitalist histories would be the winners if Cuba traded based on economic fundamentals and the former socialist countries would be the losers. Similarly, Table 2 (panel B) contains results for imports. These results suggest that Cuba has unutilized trade potential with Argentina, Brazil, Italy, Canada, France, Germany, Spain, and Netherlands. Further, Cuba has over-utilized trade potential with China and Russia. The implication of this trade distortion is also very clear. The indication is, once again, a very similar group of capitalist countries are the winners. However, import losers are again past socialist countries, Russian and China. • Repressed—countries with an average overall score of 4.00 or higher. Cuba’s freedom index was between 4.88 and 5.0 during the period of observation (1996-2000). 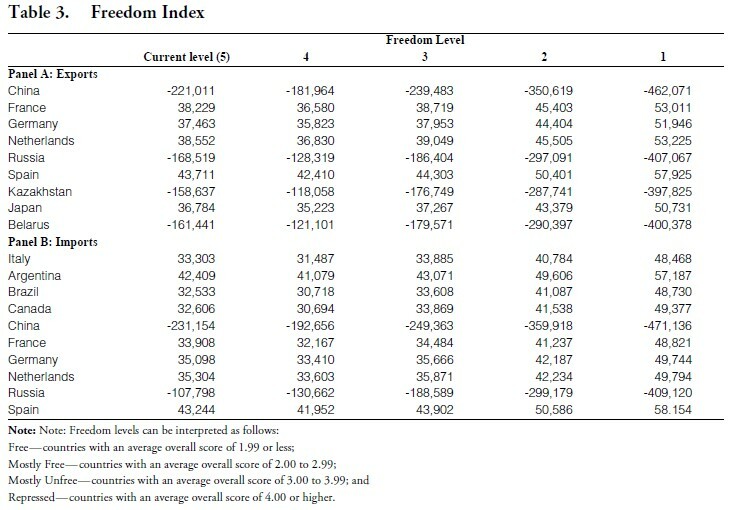 A value of 5 indicates the highest level of repression possible as measured by this freedom index. 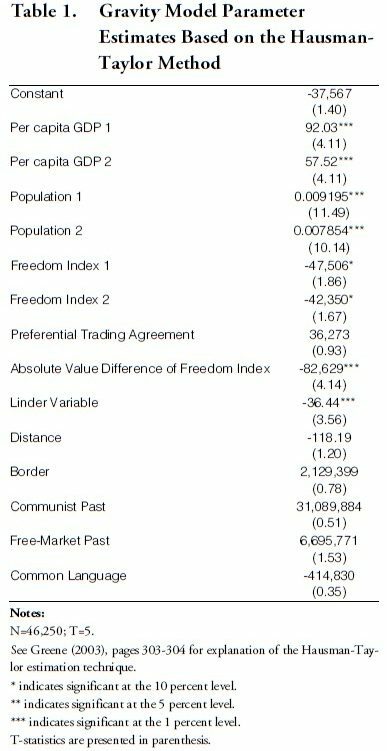 In the comparative static exercise that follows, we decrease Cuba’s freedom index score from most repressed (5) to repressed (4), mostly unfree (3), mostly free (2), and free (1). All other variables are held constant for Cuba and each country in the sample. We reassess Cuba’s trade distortion at each level of freedom. By doing so, we attempt to isolate the effect of Cuba’s governmental practices on its trading pattern. Overall, as Cuba becomes freer, there is a substantial increase in trade distortion, as measured by summing over-utilized and under-utilized trade potential. Table 3 contains the results of this exercise for Cuban exports. As Cuba becomes freer (index value is decreased), the trade distortion with countries that it under-trades with increases (at least until extreme freedom levels). Similarly, trade distortion decreases with countries with which Cuba over-trades. In other words, as Cuba’s becomes freer (holding the current trading pattern constant), there is a trend toward greater trade distortion. That is, both over-trading and under-trading potentials increase. This suggests that a shift from trade based on political considerations to economic fundamentals would result in substantially less trade with former socialist trading partners and more trade with open market countries. For imports (Table 3, panel B), the same pattern is displayed. For each country that initially has underrealized trade potential, this potential increases. In the case of Russia and China, the extent of overtrading increases very dramatically. This exercise highlights an overall theme in Cuba’s trade distortion as it relates to economic freedom. A freer Cuba would lead to considerable shift in its trading pattern. Cuba’s trading pattern would shift from one based on political policies to one that more closely resembles countries that trade based on economic fundamentals. In this analysis, we examine Cuba’s trade distortion and the implications of Cuba’s politically-based trading practices. We find evidence that Cuba, in general, has an unrealized trade potential with its capitalist trading partners. In addition, we find that trade with former socialist countries is greater than if trade were based on economic fundamentals. In an attempt to uncover how Cuba’s trading patterns would change if Cuba moved toward a freer economic system, we undertake a simulation exercise and show that as Cuba becomes more free, the distortion in its trading pattern increases. In other words, there is a general pattern of increased trade potential with its capitalist partners and decreased trade with its former socialist patterns, as well as trade based more on economic fundamentals. An issue that was not addressed in this study is the amount of trade displacement that would occur if the U.S.-Cuban trading relationship were based on economic fundamentals and not political factors. That is, to what extent would free trade between the U.S. and Cuba merely substitute for trade already occurring with Europe? We leave this topic for future research. 1. Trade statistics were obtained from Statistics Canada’s World Trade Analyzer dataset. 2. Initially, it had to import virtually all its fuel needs. But more recently it has been able, with foreign investment, to develop its domestic production of oil to the extent that it is now able to produce all of its electricity with domestic oil. 3. Due also to this special relationship, Venezuela subsidizes Cuba’s purchase of its oil, with respect to both price and financing. 4. Egger (2002) shows when estimating trade potential between EU and former CMEA countries, that large systematic differences between residuals among country groups are not found when the proper estimation technique (one with white-noise residuals) is used. Egger (2002) suggests that any systematic difference between observed and in-sample predicted trade flows indicates misspecification of the econometric model instead of unused (or overused) trade potentials. 5. Since the fixed-effects estimates are consistent whether or not such correlation exists, the random-effects estimates can be compared to the fixed-effects estimates to test whether it is appropriate to use random-effects. This test was developed by Hausman and Taylor (1978). Empirically, the random-effects model is almost always rejected. 6. See, also, Greene (2003). 7. These data were obtained from the World Bank’s Development Indicators Database. 9. These data were obtained from the Heritage Foundation / Wall Street Journal Index of Economic Freedom. http://www.heritage. org. 10. The included agreements are EC, BANG, ASEAN, ECO, GCC, LAIA, SPARTEC, MERCOSU, CEFTA, EFTA, CARICOM, CACM, CIS, BAFTA, NAFTA, PATCRA, CER, EAC, CEMAC, WAEMU, MSG, COMESA, SAPTA, and AFTA. 11. See, for example, Aitken (1973), Fidrmuc (1999), Frankel, Stein, and Wei (1995), and Yu and Zeitlow (1995). 12. These data were obtained from Direct-Line Distances International Edition. 13. There is a literature which examines the effect of border on the decision to trade within a country or between bordering countries. In this case, border has been found to have a negative effect on trade. For example, see Engel and Rogers (1996). 15. A test statistic of 37.05 is far larger than the critical value of a chi-squared with 9 degrees of freedom. μ ij μ ij μ ij 16. A test statistic of 1.57 (less than the critical value of 16.92) indicates the hypothesis that the individual effects are uncorrelated with the other regressors in the model cannot be rejected. 17. Heritage Foundation /Wall Street Journal Index of Economic Freedom. http://www.heritage.org.